The book provides an comprehensive overview of the techniques available for the joining and repair of offshore structures. Nixon starts with joining systems that do not require welding and then explores the associated engineering systems needed for joining procedures. Topics include pipe handling, hyperbaric chamber design, and principal underwater welding techniques, including wet, one atmosphere, and hyperbaric. Nixon also includes a description of the effects of environmental pressure on the various hyperbaric welding processes. A complete guide to underwater welding, this book also discusses technologies that show promise in the laboratory, but are not currently in use. 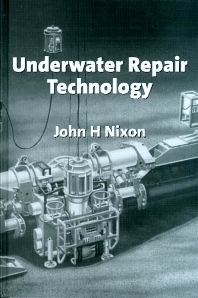 Nixon provides appendices describing the relevant diving technologies, basic oceanography, and the research methods used in the development of hyperbaric welding. This book is a must for anyone in the offshore industry, especially those involved in the joining and repair of offshore structures. John H. Nixon has a B.S. in aeronautical engineering from Bristol University, UK, and an M.S. in welding technology from Cranfield University. He currently works for the underwater wielding group at Cranfield. Nixon is responsible for the design and construction of specialized research welding and experimental systems.